Like many attendees of First Covenant Church in San Francisco, California, I was raised in a Swedish-American family. We lived above my grandfather’s bakery, where Scandinavian breads and pastries kept us well fed. But on Sundays, all three generations of the Holmgrens were found at church, where the bread of life was generously dispensed. As a child, my appetite for spiritual things was not substantial. Raised in the shadow of Kezar Stadium — home of the Forty-Niners — I was more fixated on my dream of one day wearing a Niner jersey than on Sunday school lessons. Then, when I was 11, Billy Graham held a three-week crusade at the Cow Palace in San Francisco. My parents took my sisters and me almost every night. On the final night, Cliff Barrows led the audience in singing “Just as I Am.” I couldn’t stay seated and went forward to accept Christ just as I was: grubby tennis shoes and all. But even as a Christian, I remained determined to make a name for myself on the gridiron. After leading my high school teams to the state championship, I was offered a scholarship to play for the University of Southern California Trojans. Unfortunately, injuries kept me sidelined much of my college career. I was gratefully surprised when I was drafted by the St. Louis Cardinals in 1970. But four weeks later, I was released. The New York Jets picked me up as a back-up quarterback to “Broadway Joe” Namath, but before the preseason was over, I was cut again. My dream of playing professional football was over before it ever began. I was devastated. Kathy and I married in 1971, and I began my coaching career at the high school from which I had graduated. As our family of four daughters grew, so did my professional opportunities, and I moved up into the college coaching ranks. But ambition was not the demon it had once been for me. My wife and kids were a daily reminder of both God’s blessing on my life and his priorities. Then a job opened up in Utah. Some of our friends questioned our judgment in accepting it. But Kathy and I viewed my position as assistant coach at Brigham Young University (BYU) as a unique opportunity to share our faith with the players, coaches, and students on a predominantly Mormon campus. It was during my time at BYU that the San Francisco Forty-Niners invited me to become their offensive coordinator. Although I was not a player, God had fulfilled my boyhood dream to be a part of my hometown team. Eventually, the media began to speculate that I would be offered the head coaching position of an NFL team, and I began to pray. When the offers came, it was clear to us that the needs of our daughters took precedence over my career, and I opted to stay with the Forty-Niners. Sportswriters and colleagues scoffed, but God honored our choice. Later, at the right time for our family, I was hired by the Green Bay Packers to carry the mantle of legendary head coach Vince Lombardi. In the six years I spent in Green Bay, I was fortunate enough to lead the Packers to two consecutive appearances in the Super Bowl. In 1997, we beat New England. A year later, we lost to the Broncos. I was blessed to coach a talented team of players who followed my leadership. 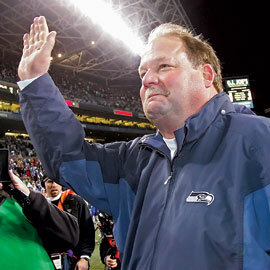 In 1998, I accepted the invitation to become head coach of the Seattle Seahawks. Although my decision was not understood by some, it seemed to be the direction the Lord was leading Kathy and me. During this past season, seven years of hard work paid off. Not only was I privileged to lead the Seahawks to their first playoff victory in 23 years, we won a bid to play in the Super Bowl by becoming NFC champions. Although the outcome against the Pittsburgh Steelers was not what we had anticipated, I was extremely proud of our team. I told them they had every reason to hold their heads high. Greg Asimakoupoulos ’74 is pastor of Mercer Island Covenant Church in Mercer Island, Washington, where Mike and Kathy Holmgren are members.